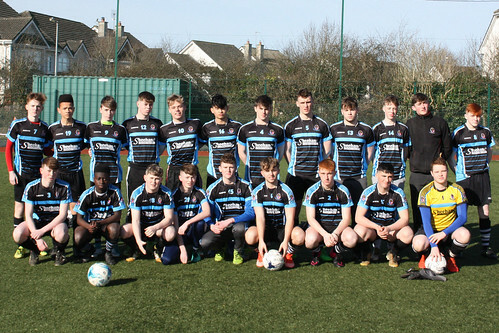 Last year’s North Munster champions Coláiste Chiaráin faced a strong Crescent Comprehensive side in the ¼ final of the North Munster cup today in Annacotty. A 4-1 win with goals from Alan Kiely, AJ Moloney, Jamie Greaves and Aaron O’Shea sees the holders progress into a semi-final against Borrisokane on Friday 16th of March. An early goal from Alan Kiely put Coláiste Chiarain 1-0 up within the first 15 minutes, however David Rickard levelled it up for Crescent a few minutes later. A magnificent first time cross from Michael Oppong into Jamie Greaves who managed to loop it over the goalkeeper into the far post put Coláiste Chiaráin back in the lead leaving it 2-1 at the end of the first half. Croom started the second half strong enjoying the majority of the possession and chances. Eventually a ball from Jimmy Leslie put AJ Moloney one on one with the keeper and he calmly slotted it home. After scoring the third goal last year’s champions dominated the rest of the half with Aaron O’Shea coming off the bench to score the final goal. This was a hugely impressive performance lead by the outstanding James Cullinane who was awarded the man of the match.